Something tells you this has got to be good - the Wighnomies have been keeping all things bassy minimal fully locked down these last couple years, and Justus has never looked back since '2 after 909' propelled him into every dj box in the country three years ago. 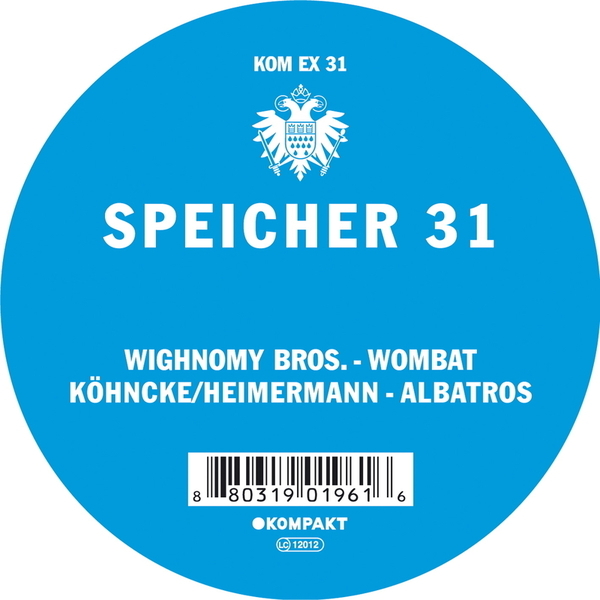 Speicher lures the Wighs in for a wonder called 'Wombat' - all acid lagging, wicked bassline and a heavenly tsunami of emotions - picking up where "Wurz & Blosse" started last summer and succeeding in totally running off with the baton. Flip for a true surprise on many levels, Justus Kohncke enlists his guitarist friend Fred Heimermann to revisit the bearded sixties easy listening blues come seventies radio 2 staple, "Albatross". Surprising to hear an ambient tune on speicher certainly, but as the crowning jewel in Peter Green's royalty stream here's hoping that this sunshine horizontal long player turns ever more people onto the early Fleetwood Mac - Now why didn't they go for a revision of 'Tusk'?! Big of course.